The etymology behind Graveyard Fields is somewhat smoky. Centuries ago massive wind storms uprooted a once prominent spruce forest in this 5,000’ high, hanging valley. Root balls from the uprooted trees slowly decayed and overtime left behind mounds of dirt, similar to those found in ancient burial grounds. In more recent history, 1925 to be exact, a raging fire swept through Graveyard Fields. The fire destroyed everything in its path, including necessary nutrients in the soil. The high valley was left as a smoldering swath of land with “headstones” – the charred, stumpy remains of the spruce forest – strewn about the landscape. Over time, leading up to the present day, Graveyard Fields has slowly recovered from its smoldering past to become a high altitude valley teeming with plant life. Today, visitors to Graveyard Fields will enjoy a mixture of Rhododendrons, Mountain Laurels, Blackberry and Blueberry bushes, high country grasses, and bouquets of wildflowers. Although the Fields have begun a long healing process their integrity is challenged annually by Graveyard Fields resounding popularity and all the inherent issues related to overuse by the outdoor community. Visitors to Graveyard Fields can enjoy its splendors by way of a newly renovated trail system which includes elevated boardwalks, an intricately integrated bridge across Yellowstone Prong, and an expertly constructed waterfall overlook at Second Falls. 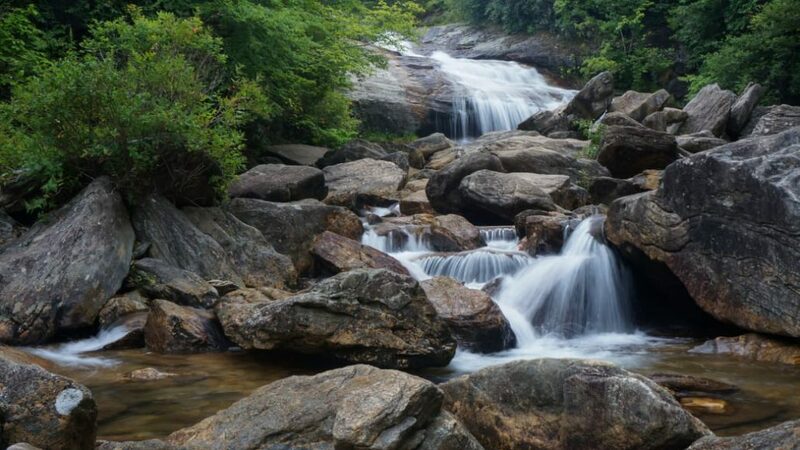 Trails within Graveyard Fields can be combined to form a 3.2-mile loop which meanders through the relatively flat valley and includes views of Upper Falls and Second Falls. A detailed trail map sign stands at the parking lot, take a picture to reference later and begin your travels in either direction. Traveling the loop in a counterclockwise direction gives explorers an immediate reward, just .3 miles in, where a wooden staircase leads to the plunge pool below Second Falls. After returning to the start of the staircase the trail continues to wind through the high valley which is enclosed by the towering massif of Black Balsam Knob. As you work your way up the valley, beside a calm section of Yellowstone Prong, you will come to a signed trail leading to Upper Falls. Take this trail for a better chance of seclusion and a glimpse of Upper Falls. Visitors in early Autumn will be treated to a dreamlike landscape, covered in the colors of Appalachia, and rich with ripe blueberries! The National Forest Service allows visitors to pick up to one gallon per person so bring a container and gather your fill. Summertime visitors can take advantage of the cooling waters of Yellowstone Prong in the plunge pool at the base of Second Falls. Savvy adventurers may even be able to find the picturesque Yellowstone Falls, just below Graveyard Fields, off of the Mountains-To-Sea Trail. Parking for Graveyard Fields can be found at mile 418.8 on the Blue Ridge Parkway. A recently constructed solar-powered restroom facility sits in the parking lot which has 40 spots. If the parking lot is full venture to nearest overlook and make the trek back to Graveyard Fields. Fair warning, parking in the grass on the side of the road will likely earn you a citation on busy days! Camping is allowed in several established sites within Graveyard Fields and dogs are welcome but must be kept on a leash at all times.